It’s been so exciting to watch as students and teachers across the country embrace virtual reality. As a consultant and professional development provider, I spend lots of time in classrooms in different parts of the country. One of my favorite parts of this role is leading demo lessons for teachers and working side-by-side with students. Virtual reality is a powerful learning tool when integrated thoughtfully into the classroom. This past month I’ve had the chance to introduce virtual reality experiences to students in PreK through fifth grade. These embedded, interactive experiences can lead to in-depth discussions. 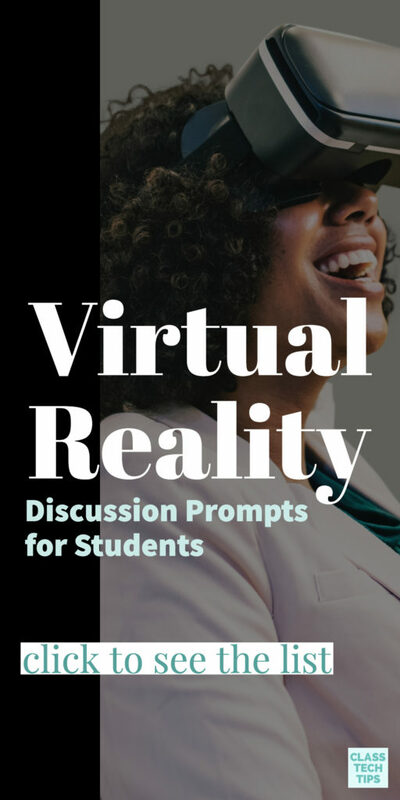 So I’ve put together a list of virtual reality discussion prompts you can tailor to your classroom. Purposeful technology integration can take many forms. Virtual reality might seem flashy and gimmicky at first. When integrated thoughtfully into instruction, virtual reality experiences can transform the way your students look at the world! If you’re a regular follower of this website (sign up here), you’ve seen me share lots of virtual reality resources over the past few years. You can use virtual reality in the classroom without headsets or with the low-cost Google Cardboard. There are lots of virtual reality apps and videos to explore – including the ones on this list. But how do you make sure these experiences are high-quality and purposeful for students? In the list below, I’ve gathered discussion prompts I’ve used with students and examples of ones you can fit into your own instruction. When leading whole-group virtual reality experiences using a tool like Nearpod, I encourage students to talk within their small groups about what is happening on their screen. If your students are using headsets with Google Expeditions, or a Google Cardboard connected app, you can have students pause to talk about what they see. What do you hear? Or think you would hear in this place? What time of day is it here? What do you think the weather is like in this place? How do you think someone captured this moment? What might be missing from this shot? How would this look different at daytime/nighttime? What might it be like to live in this place? How is what you see similar or different to a place you’ve lived? Is this a place you would want to visit? How far away are we from this place? How long would it take us to get to this place? This list is included in my free download: Getting Started with Virtual Reality. Remember, you can tailor these general questions to the specific experiences your students have when using virtual reality. For example, earlier this year I shared a panoramic view of the Grand Canyon with third-grade students. Questions on this list can be tailored to this particular experience – What animals might live in this place? Try these discussion prompts in a whole group setting, small group setting, or a think-pair-share. As students talk with their classmates, interject when necessary, but allow students to think freely. These types of discussions can also be used as “fact-finding” missions to gauge student interests in other topics. 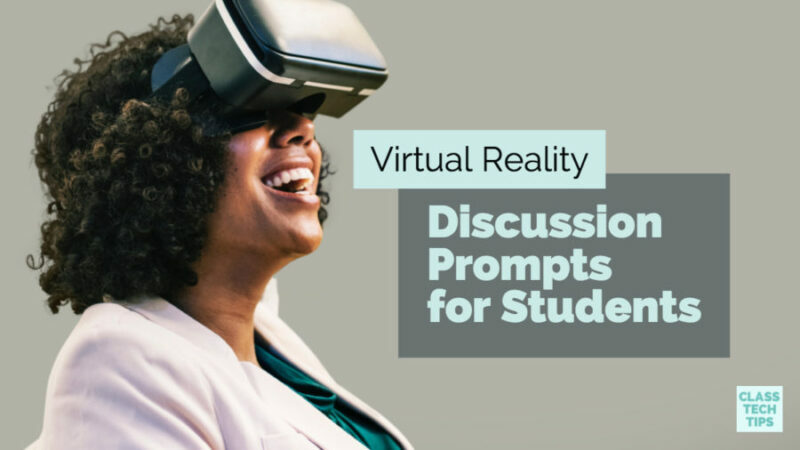 In addition to using these prompts for discussion, they could spark written or video reflections after a virtual reality experience. 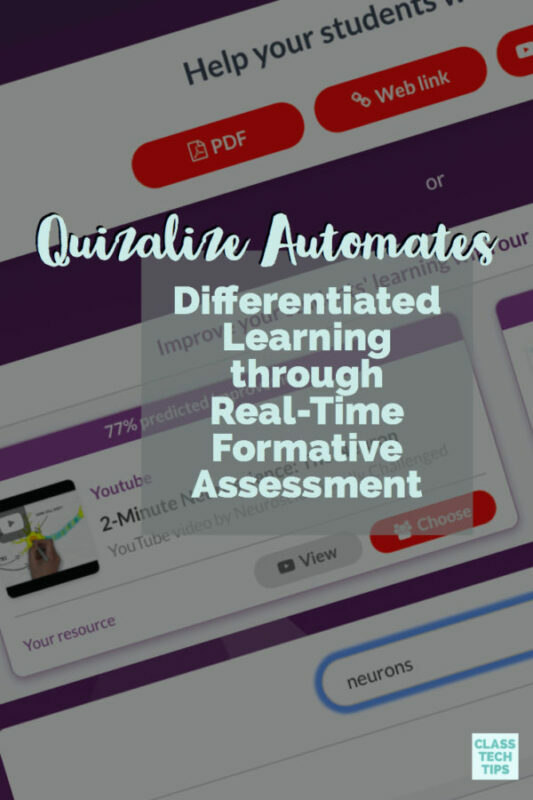 You might set up a Flipgrid page for students to use to share their observations or wondering. This way they can hear from all of their classmates even if discussion time in your classroom is cut short. Alternatively, you might use these prompts for written responses in a discussion forum in Edmodo, Google Classroom, or Schoology. Have you used virtual reality in your classroom? Share your experiences or favorite discussion prompts in the comments section. Hi Robert, thanks for sharing!